Weddings are often the most fun events in a person’s life, and planning an entire wedding weekend is a great way to make this special event even more memorable. 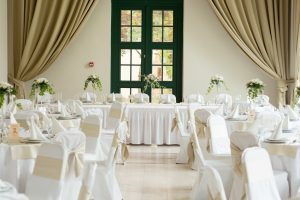 In part one, we discussed the importance of picking the perfect wedding venue and banquet hall and keeping the rehearsal dinner brief. However, that only covers half the weekend. Keep reading for more tips on planning an amazing weekend wedding. Be sure to book your reception site as early as possible. Most wedding planners will advise you and your future spouse to book the reception venue at least a year to nine months before the wedding. However, that’s not the only reservation you need to make. Depending on your plans, you and your partner may immediately leave for the honeymoon following the reception. However, if you’re planning a wedding weekend, your guests won’t be. That’s why Sunday brunches are now considered standard parts of most wedding weekends. Plan ahead to ensure that your guests will have a place to sit down and enjoy a casual Sunday brunch following the big night, even if you won’t be there to enjoy it. While weddings offer a great opportunity to spend time with friends and family you don’t often get to see, your guests may not want to spend 24 hours of the day in close quarters. Although wedding weekends are filled with busy schedules, there are usually a few hours on one of the days that are free. When planning a wedding weekend, a common mistake is trying to plan an itinerary that covers every second of the day. This is a great way to exhaust your guests, who may appreciate some time to themselves in between all the excitement. That’s why it’s important to provide your guests with options for other activities. Prepare a welcome guide for your wedding guests, and be sure to include a list of local attractions and restaurants they can visit at their leisure. What’s the easiest way to determine if a wedding was a major hit? Look back and see how many people were dancing. If only a few of your guests are on the dance floor — something needs to change. Since you’re one of the two most important people at the wedding, it’s your responsibility to get out on the dance floor and get the party started. All your guests will likely follow you if you start jamming out. Once everyone is dancing, it will truly turn into an unforgettable night. While your wedding will definitely be one of the most memorable weekends of your life, the same isn’t necessarily true for your guests. That’s why it’s important to plan a memorable wedding weekend that your guests will never forget. If you want to learn more about successful weekend weddings or check out amazing rustic setting banquet halls in Wisconsin, contact Woodfire Lodge today.